The app is amazing for exploring weather and planning trips and recreation and allows you to easily pan and zoom so you can get unmatched detail of weather in your neighborhood or half a world away. Additional information, presented in pop-up window, includes “feels like temperature”, humidity, local time, sunset/sunrise time, wind speed, wind direction and ten-day weather forecast. Road traffic and weather forecast on the map will help to choose route for long trip. eRadar HD is part of the Animated weather map. Animated weather map is part of the eWeather HD. But Animated weather map has few features missed in eWeather HD. First: eWeather HD does not have animated icons. 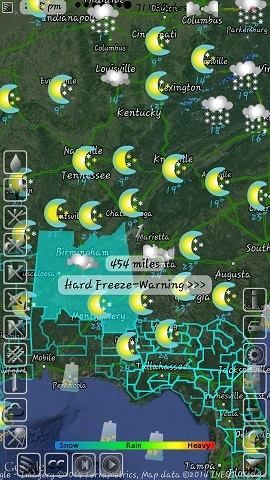 Second: eWeather HD shows only current conditions on the Google Maps. Animated weather map shows 10-day forecast and hourly forecast on the Google Maps. Third: eWeather HD does not have population and road traffic.